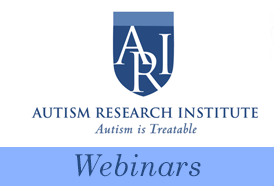 Tune in to learn about nutritional strategies for addressing anxiety and depression in ASD. Presenter: Vicki Kobliner MS RDN is a Registered Dietitian/Nutritionist with years of expertise in applying a functional approach to nutrition. She develops individualized plans for clients which are designed to promote wellness, prevent disease and rebalance underlying nutritional impairments. A key element of this approach is the optimization of digestive function. Research shows that impairments in this critical nutritional pathway can have a far reaching impact on our brain, immune, detoxification, and other seemingly unrelated systems. Vicki has extensive experience in using dietary modification, appropriate supplementation and functional lab testing to achieve optimal wellness. Vicki has extensive experience using gluten-free, dairy free, low allergen, GFCF, SCD, GAPS, FODMAPS, and other appropriate diets to reduce inflammation and promote healthy digestive function . She has contributed her expertise to www.gfcfdiet.com and worked with schools to develop a whole foods approach to student meal planning. She lectures frequently, both locally and nationally, on topics such as autism, special diets for food allergies and intolerances, healthy pregnancy planning and choosing appropriate nutritional supplementation. She has appeared on television and video. Vicki is a contributing author to the books A Compromised Generation: The Epidemic of Chronic Illness in America’s Children and Essential Remedies for Women’s Health. This webinar is made possible in part by a generous grant from Local 25, Boston Teamsters.